For 2.50 Singapore dollars, visitors can catch a boat to Pulau Ubin, a small, little-developed isle off Singapore’s main island that gives a hint of life here pre-independence: It’s populated with jungle and wildlife and a handful of residents in tin-roof homes, no running water and virtually no electricity; an undiluted immersion into nature. I liken it to time travel. No trip to Singapore would be complete without a meal at a hawker center, a microcosm of the deep multicultural heritage here (a subject unexplored by the film). “The food in Singapore is one of the best melds, not just a melting pot, of world flavors,” said K.F. Seetoh, Singapore’s de facto food ambassador and creator of the World Street Food Congress, by email. “It is beyond rich migrant-food culture.” For example, he noted that rojak, a fruit and vegetable salad whose name translates to ‘eclectic mix’ and whose origins are unclear, “is neither this nor that, but truly our own style,” an apt symbol of the many cultures of Singapore. Singaporeans are predominantly ethnically Chinese, but the pan-Asian sensibilities of the country are inescapable — from street signs and subway announcements in the country’s four official languages (Mandarin, Malay, Tamil and English), to the mosques, churches, Buddhist and South Indian temples dotted around the island, sometimes on the same stretch of road. I can think of no place that offers a profound mix of Asian cultures and cuisines so compactly. 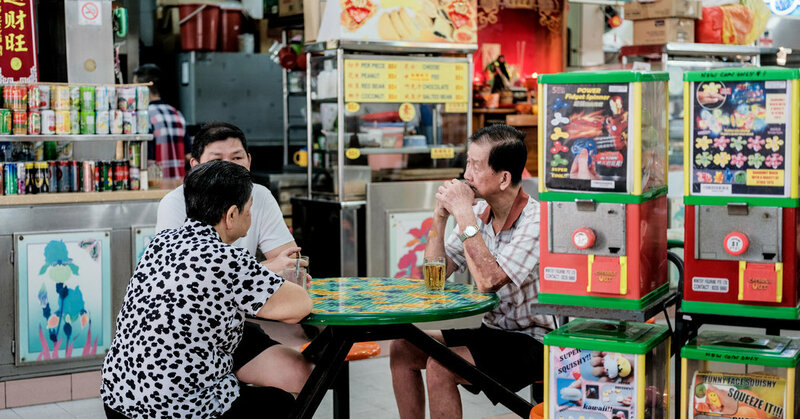 I have spent many hours at hawker centers, for a quick meal or to sip on a fresh sugar-cane juice and watch myna birds with sun-colored beaks and slick black feathers chirping and hopping between tables, waiting for falling scraps. While these dishes — lip-smacking, addictively salty, spicy, silky and costing a few dollars — originate from different parts of the continent, they are all considered wholly Singaporean, comfort food of sorts. And they are like the country as a whole: not crazy, not universally rich, but most certainly Asian.